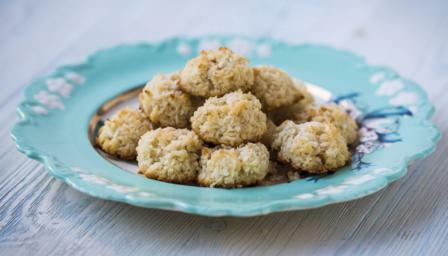 These moreish mouthfuls are coconut taste bombs suitable for vegetarians, vegans, gluten-free and dairy-free diets. One macaroon provides 55 kcal, 0.7g protein, 3g carbohydrate (of which 1.8g sugars), 4.5g fat (of which 4g saturates), 1.3g fibre and 0.1g salt. Stir all of the ingredients together in a saucepan over a medium heat until well combined. Continue to cook for 4-5 minutes until the coconut milk has been absorbed into the mixture and the mixture has thickened. Remove from the heat and set aside to cool slightly. Scoop tablespoonfuls of the macaroon mixture onto the prepared baking tray, to form small domes, leaving a gap between each. Bake in the middle of the oven for 12-15 minutes, or until toasted and golden-brown at the edges. Remove from the oven and set the macaroons aside to cool completely, then enjoy.